Second in our series of interviews with our favourite local characters. Anyone who has ever attempted to run up Primrose Hill, and has then stood at the top gazing at the view, hands on knees, panting for breath and feeling pretty darn pleased with themselves, will have felt on top of the world. Primrose Hill’s very own Daniel Hughes knows that feeling too. However, he knows it from actually being on top of the world. 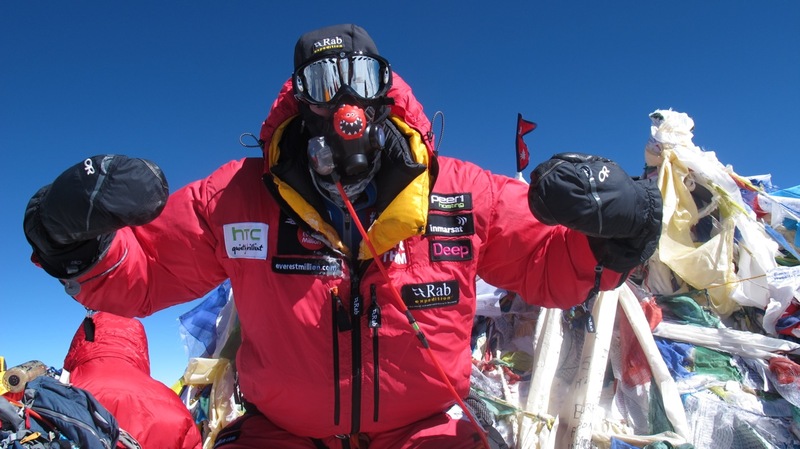 In May of this year, he climbed all 8848m of Mount Everest, the world’s highest mountain. With a Comic Relief Red Nose, to be placed like a cherry on top. This was the culmination of his Everest Million campaign, two years in the making, and at the cost of his own cash, sweat and tears. In full climbing gear on the mountain- note Red Nose! One has to ask why. Daniel made the time to meet me at one of his favourite local haunts, Anthony’s Deli on Regent’s Park Road, to tell me all about it over a latte. “We travelled through Chile and Argentina and reached the border between Argentina and Bolivia. On one side it’s all internet, high speed roads, coffee shops, really westernised; but then you go across this bridge into Bolivia, and it’s as if you’ve entered a different world. The main highway is barely navigable. Sixty per cent of the population is below the poverty line, and you’ll see these ladies, in their Bolivian dress, hats, multi-coloured shawls, sat there on the side of the road, trying to sell a packet of biscuits for 15p, to make some sort of living. 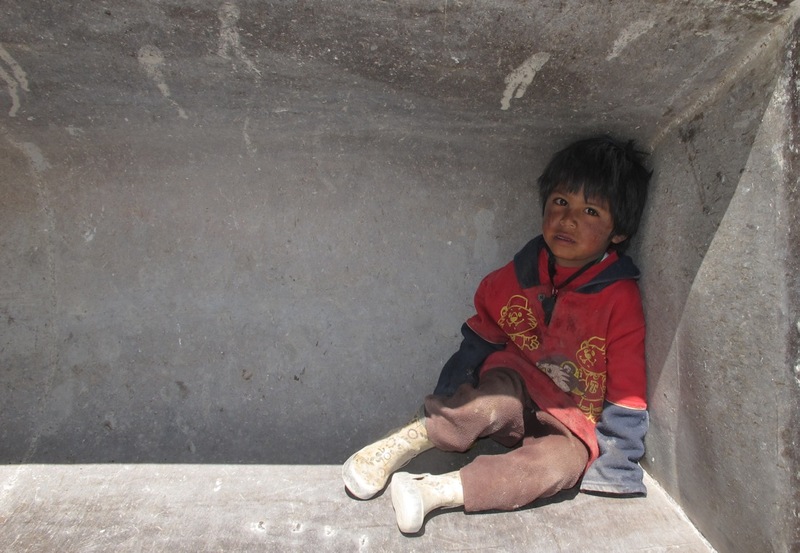 The Bolivians are very humble, very endearing people. So how did Comic Relief come into it? How did the idea to put the first Red Nose on Everest take shape? “The plan was for me to climb Aconcagua in Argentina – the highest mountain outside the Himalayas- and put the first Red Nose on top. This was January 2011. Then I wondered if anyone had ever put one on Everest, and no one had. 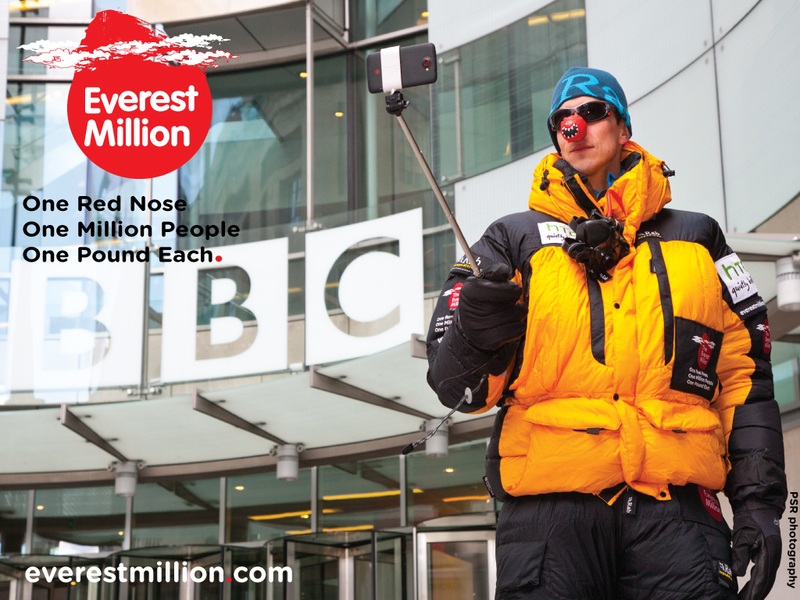 Next we came up with the whole idea of one Red Nose, one million people, one Pound each. 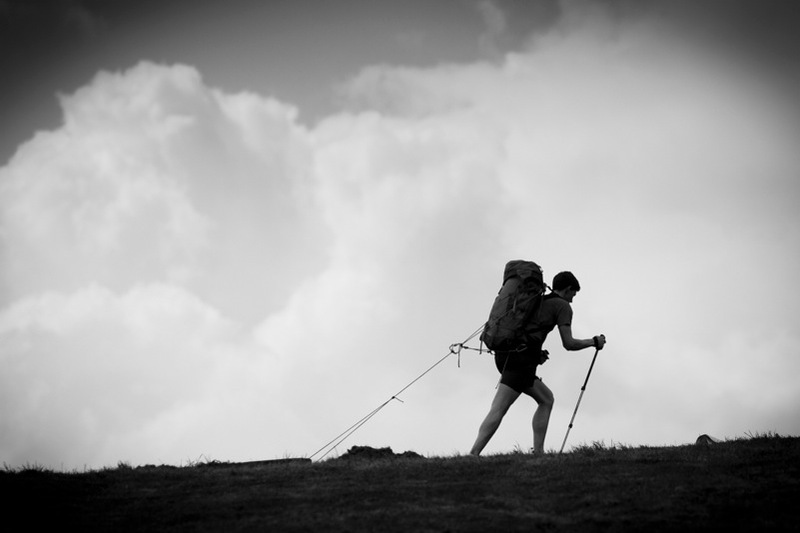 How do you organise a climb up the highest mountain in the world? Can you just turn up unannounced and crack on? It’s harder isn’t it, to get a million people involved, rather than a smaller number of people giving a larger sum of money each? What did your wife think of all this? Sometimes people don’t come back from climbing Everest, do they? The weather can turn, can’t it? Is that the main difficulty? Was this a do-or-die endeavour? “Ultimately, the money for me was the important factor of Everest. If I didn’t get to the top I would be disappointed; if I didn’t raise £1m I would be devastated. I wasn’t prepared to lose fingers or feet, or my life, to put a Red Nose on top of a mountain. We had very established gates. We agreed that if we weren’t at the South Summit by 8am we would turn around. To make sure that you don’t make stupid judgements. For a lot of people who climb Everest, the pressures are about fulfilling a life-long dream. My pressures were the sponsors, the Red Nose; I’d built up this thing around me. I wanted to deliver for my sponsors and everyone following me. ILovePrimroseHill was following his relentless training; did it stand him in good stead? Carali was with you up to a certain point? What are his next challenges? Well most of us will never do it in the first place. Is that like Steve Redgrave saying if you see him get back in a boat, shoot him, before winning a fifth gold? Daniel is clearly not ready to hang up his crampons, however. “I’m supposed to be retired, buying a house, all that sort of stuff, but my mind’s whirring, and actually I’ve had so many offers of support that I think I almost owe it to myself to do another one. Now I’ve got a really good foundation, so with the next one I might actually make the million quid. If I did do something else, I would pitch it so I get the charity fully behind me. I think that’s where I struggled really. It’s a bit unfortunate that the timing wasn’t during Comic Relief week. Having started the campaign from his home in Chalcot Crescent, Daniel moved away briefly, but is now settling down again in Primrose Hill. What does he like about the area? “The park! Every day we go for a walk up the hill or around Regent’s Park. It’s an oasis of calm in a manic city. And of course the independent shops and pubs.’ Daniel’s favourite pub is the Lansdowne, where he has a Turkish pizza habit, his record being two for one meal. Anthony’s Deli is also a favourite for their large sandwiches. The calories for all that training have to come from somewhere! With donations currently standing just above £47000, Daniel is disappointed to be so far off his original target, but is now gunning to at least break through the £50K barrier. This is where you come in. He only wants a single pound per person, but if you can do better than that, I’m sure he would be delighted. A great guy, inspired by experience, raising funds for a great cause. Text Nose70 £x (x is the amount) to 70070, or click below and give. Tell him I sent you. At the summit: he made it!